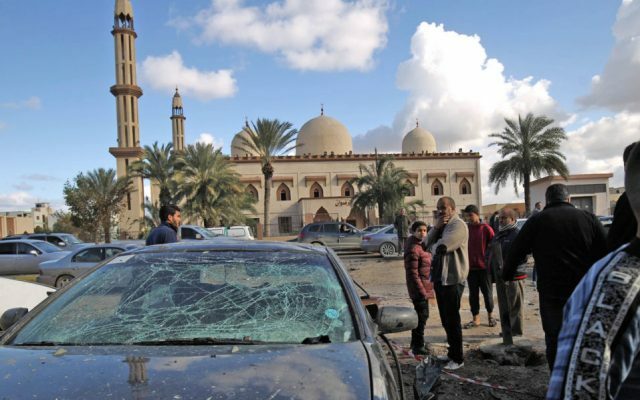 Benghazi : At least 37 people died and scores were wounded after two car bombings outside a mosque frequented by jihadist opponents in Libya’s second city Benghazi, medical officials said Wednesday. The attack after evening prayers on Tuesday underlined the continued chaos in Libya, which has been wracked by violence and divisions since dictator Moamer Kadhafi was toppled and killed in a 2011 NATO-backed uprising. Benghazi has been relatively calm since military strongman Khalifa Haftar announced the eastern city’s “liberation” from jihadists in July last year after a three-year campaign, but sporadic violence has continued. The bombers blew up two cars 30 minutes apart outside the mosque in the central neighbourhood of Al-Sleimani, according to security officials. Emergency and security workers, who had rushed to the scene, were among those killed in the second blast. Mourners gathered outside the mosque on Wednesday, walking through puddles of water stained red with blood. Vehicles in a parking lot outside the mosque were burnt-out and mangled, their windows shattered. A toll collated by security forces from hospital data put the number of dead at 37, including an Egyptian and a Sudanese citizen. Almost 90 people were wounded. Ahmad al-Fituri, a security official for Haftar’s forces, was among those killed, military spokesman Milud al-Zwei said. Witnesses said that in revenge for the attacks commander Mahmoud al-Werfalli from Haftar’s forces, who is wanted by the International Criminal Court, executed suspected jihadist detainees at the scene of the bombings. Werfalli is accused by international prosecutors of carrying out or ordering the killing of at least 33 people in 2016 and 2017.